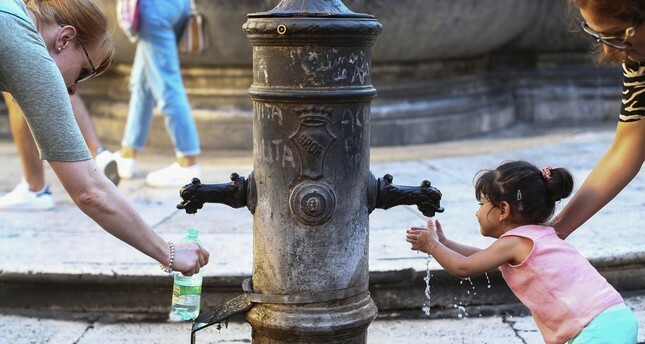 Baking summer heat has forced Rome to close some of the drinking fountains known as "big noses", or "nasoni", that constantly gush fresh water on thousands of street corners, causing a public outcry. Hit by the soaring temperatures drying out southern Europe, the Italian capital has started turning off up to 30 of the 2,800 distinctive curved metal taps every day, dismaying Romans and prompting concerns homeless people would become dehydrated. Brandishing a plastic bottle in the central Piazza Venezia, city resident Carmelo Teti asked, "How can you take away fresh water from tourists who walk and want to refresh themselves?" "When I go around I fill up this bottle with water because to buy mineral water costs and I cannot afford it," he said. In a letter to Rome's mayor, Virginia Raggi, water company Acea blamed the "exceptional drought" for the temporary measure and said: "We are absolutely aware of the inconvenience that might be caused." The company said it was committed to replacing and fixing the city's decayed and ruptured pipes, which according to consumer group Codacons leak 40 percent of the water they carry. Part of the plan is also to help limit the amount of water taken from picturesque nearby Lake Bracciano, whose sinking surface level has prompted a local campaign to protect it. The Committee for the Defence of Lake Bracciano was critical, saying: "You won't save Lake Bracciano by leaving Rome's homeless thirsty," echoing a warning from the Red Cross. Environmental group Eco Italia Solidale said the "big noses" accounted for only 1 percent of Rome's water supply but helped in keeping sewers clean and watering plants in public places.